Opus Dei (Latin for "Work of God"), formally known as The Prelature of the Holy Cross and Opus Dei, is an organization of the Roman Catholic Church that emphasizes the belief that everyone is called to holiness and that ordinary life is a path to sanctity. Opus Dei was founded in Spain in 1928 by the Roman Catholic priest Josemaría Escrivá and given final approval in 1950 by Pope Pius XII. In 1982, it was made into a personal prelature — its bishop's jurisdiction is not linked to one specific geographic area, but instead covers the persons in Opus Dei, wherever they are. Opus Dei is the first and so far the only Catholic organization of this type. The Opus Dei prelature is made up of ordinary lay people and secular priests governed by a prelate. Most of its members called supernumeraries, lead traditional family lives and have secular careers. The other three classes of members, numeraries, associates, and numerary-assistants, are celibate, and often live in special centers. Some ex-members and their families, liberal Catholics, secularists, and supporters of liberation theology have argued that Opus Dei is cult-like, secretive, and highly controlling. John Allen, Jr. and Vittorio Messori, Catholic journalists who studied Opus Dei, state that these allegations are mere myths. For Massimo Introvigne, a Catholic sociologist, Opus Dei is intentionally stigmatized by its opponents, because they "cannot tolerate the 'return to religion' of the secularized society." 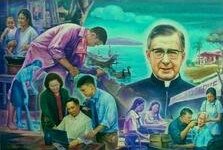 Various Popes and Catholic leaders have strongly supported Opus Dei's innovative teaching on the sanctifying value of work, and in 2002, Pope John Paul II canonized Saint Josemaría Escrivá. Escrivá surrounded by working people, in a Filipino painting entitled, Magpakabanal sa Gawain or "Be a saint through your work". Initially, Opus Dei was open only to men, but in 1930, Escrivá created a women's branch. In 1936, the organization suffered a temporary setback when rampant killing of ecclesiastics occurred due to the Spanish Civil War, forcing Escrivá to go into hiding. After the civil war was won by General Francisco Franco's Nationalists, Escrivá was able to return to Madrid. Escriva said that it was in Spain where Opus Dei found "the greatest difficulties" because of traditionalists who misunderstood Opus Dei's ideas, still Opus Dei flourished during the years of Franco's rule, spreading first throughout Spain, and after 1945, expanding internationally. In 1939, Escrivá published The Way, a collection of 999 maxims concerning spirituality. In the 1940s, Opus Dei found an early critic in the Jesuit leader Wlodimir Ledochowski, who told the Vatican that he considered Opus Dei "very dangerous for the Church in Spain," citing its "secretive character" and calling it "a form of Christian Masonry." In 1946, Escrivá moved the organization's headquarters to Rome. In 1950, Pope Pius XII granted definitive approval to Opus Dei, thereby allowing married people to join the organization. In 1975, Escriva died and was succeeded by Alvaro del Portillo. In 1982, Opus Dei was made into a personal prelature. This means the Opus Dei related objectives of the members fall under the direct jurisdiction of the Prelate of Opus Dei wherever they are. As to "what the law lays down for all the ordinary faithful," the lay members of Opus Dei, being no different from other Catholics, "continue to be …under the jurisdiction of the diocesan bishop," in the words of John Paul II´s Ut Sit. n 1994, Javier Echevarria became Prelate upon the death of his predecessor. One-third of the world's bishops sent letters petitioning for the canonization of Escrivá. In 2002, approximately 300,000 people gathered in Saint Peter's Square on the day Pope John Paul II canonized Josemaría Escrivá. According to one author, "Escrivá is… venerated by millions". There are other members whose process of beatification has been opened: Ernesto Cofiño, a father of five children and a pioneer in pediatric research in Guatemala; Montserrat Grases, a teenage Catalan student who died of cancer; Toni Zweifel, a Swiss engineer; and Bishop Alvaro del Portillo. Opus Dei is an organization within the Roman Catholic church. As such, it ultimately shares the theology of the Catholic Church. Opus Dei places special emphasis on certain aspects of Catholic doctrine. A central feature of Opus Dei's theology is its focus on the lives of the ordinary Catholics who are neither priests nor monks. Opus Dei emphasizes the "universal call to holiness": the belief that everyone should aspire to be a saint, that sanctity is within the reach of everyone, not just a few special individuals. Opus Dei does not have monks or nuns, and only a minority of its members are part of the priesthood. A related characteristic is Opus Dei's emphasis on uniting spiritual life with professional, social, and family life. Whereas the members of some religious orders might live in monasteries and devote their lives exclusively to prayer and study, members of Opus Dei lead ordinary lives, with traditional families and secular careers, and strive to "sanctify ordinary life." Indeed, Pope John Paul II called Escrivá "the saint of ordinary life". Similarly, Opus Dei stresses the importance of work and professional competence. While some religious orders encourage their members to withdraw from the material world, Opus Dei's members are exhorted to "find God in daily life" and to perform their work excellently as a service to society and as a fitting offering to God. Opus Dei teaches that work not only contributes to social progress but is "a path to holiness." and its founder advised members to: "Sanctify your work. Sanctify yourself in your work. Sanctify others through your work." At the bottom of Escriva's understanding of the “universal call to holiness” are two dimensions, subjective and objective. The subjective is the call given to each person to become a saint, regardless of his place in society. The objective refers to the teaching that all of creation, even the most material situation, is a meeting place with God, and leads to union with Him. Leaders of Opus Dei describe the organization as a teaching entity, whereby Catholics are taught to assume personal responsibility in sanctifying the secular world from within. Its lay people and priests organize seminars, workshops, retreats, and classes to help people put the Christian faith into practice in their daily lives. Spiritual direction, one-on-one coaching with a more experienced lay person or priest, is considered the "paramount means" of training. Through these activities they provide religious instruction (doctrinal formation), coaching in spirituality for lay people (spiritual formation), character and moral education (human formation), lessons in sanctifying one's work (professional formation), and know-how in evangelizing one's family and workplace (apostolic formation). The head of the Opus Dei prelature is known as the Prelate. The Prelate is the primary governing authority and is assisted by two councils — the General Council (made up of men) and the Central Advisory (made up of women). The Prelate holds his position for life. The current prelate of Opus Dei is Monsignor Javier Echevarria, who became the second Prelate of Opus Dei in 1994. 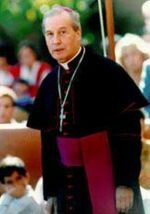 The first Prelate of Opus Dei was Monsignor Alvaro del Portillo, who held the position from 1982 until his death in 1994. Opus Dei's highest assembled bodies are the General Congresses, which are usually convened once every eight years. There are separate congresses for the men and women's branch of Opus Dei. The General Congresses are made up of members appointed by the Prelate, and are responsible for advising him about the prelature's future. The men's General Congress also elects the Prelate. After the death of a Prelate, a special elective General Congress is convened. They elect from their ranks one individual to become the next Prelate — an appointment that must be confirmed by the Pope. Opus Dei has about 87,000 members in more than 80 different countries. About 60 percent of Opus Dei members reside in Europe, and 35 percent reside in the Americas. The organization's assets total at least $2.8 billion. Two members of Opus Dei, Juan Luis Cipriani and Julián Herranz, have achieved the rank of Cardinal. Opus Dei runs residential centers throughout the world. These centers provide residential housing for celibate members, undertake recruitment, and provide doctrinal and theological education. Opus Dei is also responsible for a variety of non-profit institutions called "Corporate Works of Opus Dei." A study of the year 2005, showed that members have cooperated with other people in setting up a total of 608 social initiatives: schools and university residences (68 percent), technical or agricultural training (26 percent), universities, business schools and hospitals (6 percent). The University of Navarra in Pamplona, Spain is a corporate work of Opus Dei which has been rated as one of the top private universities in the country, while its business school, IESE, was adjudged one of the best in the world by the Financial Times and the Economist Intelligence Unit. Supernumeraries, the largest type, currently account for about 70 percent of the total membership. Typically, supernumeraries are married men and women with careers. Supernumeraries devote a portion of their day to prayer, in addition to attending regular meetings and taking part in activities such as retreats. Due to their career and family obligations, supernumeraries are not as available to the organization as the other types of members, but they typically contribute financially to Opus Dei, and they lend other types of assistance as their circumstances permit. Numeraries, the second largest type of members of Opus Dei, comprise about 20 percent of total membership. Numeraries are celibate members who usually live in special centers run by Opus Dei. Both men and women may become numeraries, although the centers are strictly gender-segregated. Numeraries generally have careers and devote the bulk of their income to the organization. Numerary assistants are unmarried, celibate female members of Opus Dei. They live in special centers run by Opus Dei but do not have conventional jobs outside the centers — instead, their professional life is dedicated to looking after the domestic needs of the centers. Associates are unmarried, celibate members who typically have family or professional obligations. Unlike numeraries and numerary assistants, the associates do not live inside the special Opus Dei centers. The Clergy of the Opus Dei Prelature are priests who are under the jurisdiction of the Prelate of Opus Dei. They are a minority in Opus Dei— only about two percent of Opus Dei members are part of the clergy. Typically, they are numeraries or associates who ultimately joined the priesthood. The Priestly Society of the Holy Cross consists of priests associated with Opus Dei. Part of the society is made up of the clergy of the Opus Dei prelature — members of the priesthood who fall under the jurisdiction of the Opus Dei prelature are automatically members of the Priestly Society. Other members in the society are traditional diocesan priests — clergymen who remain under the jurisdiction of a geographically-defined diocese. Technically speaking, such diocesan priests have not "joined" Opus Dei membership, although they have joined a society that is closely affiliated with Opus Dei. The Cooperators of Opus Dei are those who, despite not being members of Opus Dei, collaborate in some way with Opus Dei — usually through praying, charitable contributions, or by providing some other assistance. Cooperators are not required to be celibate or to adhere to any other special requirements. Indeed, cooperators are not even required to be Christian. In accordance with Catholic theology, membership is granted when a vocation, or divine calling is presumed to have occurred. Much public attention has focused on Opus Dei's practice of mortification — the voluntary offering up of discomfort or pain to God. Mortification has a long history in many world religions, including the Catholic Church. It has been endorsed by popes as a way of following Christ who died in a bloody crucifixion and who gave this advice: "renounce yourself, take up the cross daily, and follow me." Supporters say that opposition to mortification is rooted in having lost (1) the "sense of the enormity of sin" or offense against God, (2) the notion of "wounded human nature" and of concupiscence or inclination to sin, and thus the need for "spiritual battle," and (3) a spirit of sacrifice for "supernatural ends" and not only for physical enhancement. As a spirituality for ordinary people, Opus Dei focuses on performing sacrifices pertaining to normal duties and to its emphasis on charity and cheerfulness. Additionally, Opus Dei celibate members practice "corporal mortifications" such as sleeping without a pillow or sleeping on the floor, fasting, or remaining silent for certain hours during the day. They may also wear a cilice, a small metal chain with inward-pointing spikes that is worn around their upper thigh. The cilice's spikes cause discomfort and may leave small marks, but typically do not cause bleeding. Numeraries in Opus Dei generally wear a cilice for two hours each day. Although use of the cilice is no longer common, its practice in the Catholic Church is "more widespread than many observers imagine." In modern times it has been used by Blessed Mother Teresa, Saint Padre Pio, and slain archbishop Óscar Romero. On the other hand, critics state that self-mortification is a "startling," "extreme," and "questionable" practice — one that borders on masochism. Escrivá's opponents point out that his personal mortification practices were even more extreme than the those typically performed by Opus Dei numeraries— in one incident, Escrivá flailed himself over a thousand times. Opponents likewise criticize Escrivá's maxim on suffering: "Loved be pain. Sanctified be pain. Glorified be pain!" Critics have cited mortification as one of the reasons for their opposition to Opus Dei. Pope John Paul II, who made Opus Dei the first, and so far the only personal prelature. The bishop of Madrid where Opus Dei was born, Leopoldo Eijo y Garay, supported Opus Dei and defended it in the 1940s by saying that "this opus is truly Dei" (this work is truly God's). Contrary to attacks of secrecy and heresy, the bishop described Opus Dei's founder as someone who is "open as a child" and "most obedient to the Church hierarchy." Opus Dei is "a vigorous expression of the perennial youth of the Church, fully open to the demands of a modern apostolate... We look with paternal satisfaction on all that Opus Dei has achieved and is achieving for the kingdom of God, the desire of doing good that guides it, the burning love for the Church and its visible head that distinguishes it, and the ardent zeal for souls that impels it along the arduous and difficult paths of the apostolate of presence and witness in every sector of contemporary life." Despite his praise, the relationship between Paul VI and Opus Dei has been described by one Opus Dei critic as "stormy". After the Second Vatican Council concluded in 1965, Pope Paul VI denied Opus Dei's petition to become a personal prelature. "[Opus Dei] has as its aim the sanctification of one’s life, while remaining within the world at one’s place of work and profession: to live the Gospel in the world, while living immersed in the world, but in order to transform it, and to redeem it with one’s personal love for Christ. This is truly a great ideal, which right from the beginning has anticipated the theology of the lay state of the Second Vatican Council and the post-conciliar period." The current pope, Benedict XVI, is also a particularly strong supporter of Opus Dei and of Escrivá. Pointing to the name "Work of God," Benedict XVI (then Cardinal Joseph Ratzinger), wrote that "The Lord simply made use of [Escrivá] who allowed God to work." Ratzinger cited Escrivá for correcting the mistaken idea that holiness is reserved to some extraordinary people who are completely different from ordinary sinners: Even if he can be very weak, with many mistakes in his life, a saint is nothing other than to speak with God as a friend speaks with a friend, allowing God to work, the Only One who can really make the world both good and happy. "the theocentrism of Escrivá...means this confidence in the fact that God is working now and we ought only to put ourselves at his disposal...This, for me, is a message of greatest importance. It is a message that leads to overcoming what could be considered the great temptation of our times: the pretense that after the 'Big Bang' God retired from history." Opus Dei has been called "the most controversial force in the Catholic Church", and Escrivá has been described as a "polarizing" figure. In the English-speaking world, the most vocal critic of Opus Dei is a group called the Opus Dei Awareness Network (ODAN), a non-profit organization that exists "to provide education, outreach and support to people who have been adversely affected by Opus Dei." ODAN is headed by Diane DiNicola, mother of a former member, Tammy DiNicola. Other critics include former members of Opus Dei, liberal catholic theologians such as Fr. James Martin, a Jesuit, and supporters of Liberation theology, such as Penny Lernoux and Michael Walsh, an ex-Jesuit. David Clark, who specializes in helping people leave cults, say that Opus Dei is either a "cult," or at least "cult-like." Critics state that Opus Dei is "intensely secretive"— for example, members generally do not publicly disclose their affiliation with Opus Dei, and under the 1950 constitution, members were expressly forbidden to reveal themselves without the permission of their superiors. This practice has led to rampant speculation about who may be a member. Opus Dei has been accused of deceptive and aggressive recruitment practices such as showering potential members with intense praise ("Love bombing"), instructing numeraries to form friendships and attend social gatherings explicitly for recruiting purposes, and even requiring regular written reports from its members about those friends who are potential recruits. Most of all, critics allege that the group maintains an extremely high degree of control over its members— there used to be a time when numeraries submitted their incoming and outgoing mail to their superiors to read, and members are forbidden to read certain books without permission from their superiors. Critics charge that Opus Dei pressures numeraries to sever contact with non-members, including their own families. Concerning the group's role in the Catholic Church, critics have argued that Opus Dei's unique status as a personal prelature gives it too much independence, making it essentially a "church within a church". Some critics claim that Opus Dei exerts a disproportionately large influence within the Catholic Church itself, citing for example the unusually rapid canonization of Escrivá, which some considered to be irregular. Lastly, Opus Dei, as a part of the Roman Catholic Church, also shares any criticisms of Catholicism in general— for example, some criticize the fact that female members of Opus Dei cannot become priests or prelates. Supporters of Opus Dei contend that Opus Dei has been falsely maligned. John L. Allen, Jr., a journalist, explained this view by saying: "There are two Opus Deis: an Opus Dei of myth and an Opus Dei of reality," since he perceived that Opus Dei members generally practice what they preach. He says accusations of secrecy stem from mistakenly equating its members with monks and expecting members to behave as clerics. Instead, its lay members, like any normal professional, are ultimately responsible for their personal actions, and do not externally represent the prelature which provides them spiritual training. Opus Dei itself, he says, provides abundant information. To explain the celibate lifestyle of numeraries and their relationship with their family, supporters quote Jesus's comment that "He who loves his father or mother more than me is not worthy of me". Catholic officials say that church authorities have even greater control of Opus Dei now that its head is a prelate appointed by the Pope and they argue members are "even more conscious of belonging to the Church". Supporters deny that support of Franco during the Spanish Civil War was unique to Opus Dei. As John L. Allen, Jr. observed: "It’s worth noting that in the context of the Spanish Civil War, in which anticlerical Republican forces killed 13 bishops, 4,000 diocesan priests, 2,000 male religious, and 300 nuns, virtually every group and layer of life in the Catholic Church in Spain was ‘pro-Franco’." He said that at the end of Franco's regime, Opus Dei members were 50-50 for and against Franco. Peter Berglar, a German historian and Opus Dei member, argued that connecting Opus Dei with the Franco government is a "gross slander," because there were notable members of Opus Dei who were vocal critics of the Franco Regime. Similarly Alvaro del Portillo, the former Prelate of Opus Dei, said that any claims that Escrivá supported Hitler were "a patent falsehood," that were part of "a slanderous campaign". He and others have stated that Escriva condemned Hitler as a "rogue," a "racist" and a "tyrant." Allen said that Escriva was staunchly non-political, and repeatedly stressed that freedom is an essential element of Opus Dei. He said that Escriva's relatively quick canonization does not have anything to do with power but with improvements in procedures and John Paul II's decision to make Escriva's sanctity and message known. Supporters of Opus Dei have also questioned the motives and reliability of some critics. Sociologists like Bryan R. Wilson point out that some former members of any religious group may have psychological or emotional motivations to criticize their former groups, and they claim that such individuals are prone to create fictitious "atrocity stories" which have no basis in reality. Many supporters of Opus Dei have expressed the belief that the criticisms of Opus Dei stem from a generalized disapproval of spirituality, Christianity, or Catholicism. Expressing this sentiment, one Opus Dei member, Julian Cardinal Herranz, stated "Opus Dei has become a victim of Christianophobia." Massimo Introvigne, a sociologist, argues that critics employ the term "cult" in order to intentionally stigmatize Opus Dei because "they cannot tolerate 'the return to religion' of the secularized society". Since 2003, Opus Dei has received world attention as a result of Dan Brown's novel The Da Vinci Code and the 2006 film based on the novel. In The Da Vinci Code, Opus Dei is portrayed as a Catholic organization that is led into a sinister international conspiracy. In general, The Da Vinci Code has been sharply criticized for its numerous factual inaccuracies, and its conspiracy theory has been debunked by a wide array of scholars and historians. According to the Bishop of Durham, the Rt Rev Dr Tom Wright, the novel is a "great thriller" but "lousy history". For example, the major villain in The Da Vinci Code is a monk who is member of Opus Dei — but in reality there are no monks in Opus Dei. The Da Vinci Code implies that Opus Dei is the Pope's personal prelature — but the term "personal prelature" does not refer to a special relationship to the Pope: It means an institution in which the jurisdiction of the prelate is not linked to a geographic territory but over persons, wherever they be. Nonetheless, Brown claims that his portrayal of Opus Dei was based on interviews with members and ex-members, and books about Opus Dei. An Opus Dei spokesman questions this claim. ↑ 1.0 1.1 1.2 1.3 1.4 Pope John Paul II. Apostolic Constitution Ut Sit, Establishing Opus Dei as the first Personal Prelature of the Catholic Church. Retrieved 2006-11-27. ↑ Address of John Paul II in Praise of St. Josemaria, Founder of Opus Dei. Retrieved 2007-06-08. ↑ 3.0 3.1 Religious Movements Homepage Project entry on Opus Dei. University of Virginia. Retrieved 2006-11-27. ↑ 4.0 4.1 4.2 4.3 4.4 4.5 Historical Overview. Opus Dei Official Site. Retrieved 2006-11-27. ↑ 5.0 5.1 5.2 5.3 Opus Dei. BBC Religion and Ethics. Retrieved 2006-11-27. ↑ 6.0 6.1 Kim Lawton (June 29, 2001). Opus Dei. PBS Religion & Ethics Newsweekly. Retrieved 2006-11-28. ↑ 7.0 7.1 Opus Dei’s focus on secular life. Opus Dei Official Site. Retrieved 2006-11-27.; John Allen, Jr. Opus Dei, 2005 and Vittorio Messori, Opus Dei, 1997. ↑ 8.0 8.1 Massimo Introvigne (1994). Opus Dei and the Anti-cult Movement. Retrieved 2006-11-28. ↑ 9.0 9.1 9.2 Papal statements on Opus Dei. Opus Dei Official Site. Retrieved 2006-11-27. ↑ St. Josemaría Escriva de Balaguer. Catholic Online. Retrieved 2006-11-27. ↑ Opus Dei. JosemariaEscriva.info. Retrieved 2006-11-27. ↑ Vatican proves the power of Opus Dei Founder. The Daily Telegraph. Retrieved 2006-11-27. ↑ 13.0 13.1 13.2 Pope Benedict XVI on St. Josemaría Escriva. Opus Dei Official Site. Retrieved 2006-11-27. 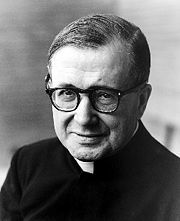 ↑ Josemaria Escrivá The Founding of Opus Dei. JosemariaEscriva.info. Retrieved 2006-11-27. ↑ Josemaría Escriva, Conversations 60. Retrieved 2006-05-16. ↑ Josemaria Escriva: Highlights of His Life. Eternal Word Television Network. Retrieved 2006-11-27. ↑ Historical Overview. JosemariaEscriva.info. Retrieved 2006-11-27. ↑ Josemaria Escrivá Conversations 33. Retrieved 2007-05-30. ↑ The Way. EscrivaWorks.org. Retrieved 2006-11-27. ↑ Philip Copens. Deciphering the Da Vinci Code. Retrieved 2006-11-27. ↑ Opus Dei. MSN Encarta. Retrieved 2006-11-27. ↑ Blessed Josemaría Escrivá to be canonized. Opus Dei Official Site. Retrieved 2006-11-27. ↑ John L. Allen Jr. 300,000 pilgrims turn out for canonization of Opus Dei founder. National Catholic Reporter. Retrieved 2006-11-27. ↑ The Process of Canonization. JosemariaEscriva.info. Retrieved 2006-11-27. ↑ 25.0 25.1 25.2 25.3 25.4 John Allen (2005). Opus Dei: An Objective Look Behind the Myths and Reality of the Most Controversial Force in the Catholic Church. Doubleday Religion. ↑ Guardian/Associated Press. Pope blesses statue of Opus Dei founder. Retrieved 2007-04-02. ↑ Opus Dei’s focus on secular life. Opus Dei Official Site. Retrieved 2006-11-28. ↑ 'Da Vinci' And Opus Dei. The New York Sun. Retrieved 2006-11-27. ↑ A Glimpse Inside a Catholic 'Force': Opus Dei. National Public Radio. Retrieved 2006-11-27. ↑ 31.0 31.1 Opus Dei called 'complete opposite' of 'The Da Vinci Code' portrayal. Catholic News Service. Retrieved 2006-11-27. ↑ Decree of Canonization. JoseMaria.info. Retrieved 2006-11-27. ↑ Josemaría Escrivá. Chapter 15: "Work". Furrow. Retrieved 2006-11-27. ↑ "Josemaria Escriva: Work and Holiness". Eternal Word Television Network. Retrieved 2006-11-27. ↑ Josemaría Escrivá. "Opus Dei: an Association which fosters the Search for Holiness in the World". Conversations. Retrieved 2007-04-13. ↑ "Opus Dei as a Political Force in Post Cold War Latin America: Civil Society, Associationalism, and Democracy". American Political Science Association. Retrieved 2006-11-27. ↑ Interview with Opus Dei National Spokesman. ABC News. Retrieved 2006-11-27. ↑ Homily of Bishop Echevarría. Romana: Official Bulletin of Opus Dei. Retrieved 2006-11-27. ↑ Message of Opus Dei. Opus Dei website. Retrieved 2007-03-11. ↑ or a "great catechsis" Catechetical Trips. JosemariaEscriva.info. Retrieved 2006-11-27. ↑ Domingo Ramos-Lissón. The Example of the Early Christians in Blessed Josemaria's Teachings. Romana: The Official Bulletin of Opus Dei. Retrieved 2006-11-27. ↑ 46.0 46.1 Place in the Church. Opus Dei Official Site. Retrieved 2006-11-27. ↑ Dennis Dubro. Government, Direction and Control in Opus Dei. Retrieved 2006-11-27. ↑ What is Opus Dei - Governance. Opus Dei Official Site. Retrieved 2006-11-28. ↑ 49.0 49.1 Opus Dei. IdeasRapidas.org. Retrieved 2006-11-27. ↑ Ruth Gledhill. Controversial Catholic group is given care of parish church. Times Online. Retrieved 2006-11-27. ↑ Opus Dei: Its Mission, Structure and Members. Zenit News Agency. Retrieved 2006-11-27. ↑ Opus Dei has stake in new pope. Newsday. Retrieved 2006-11-27. ↑ Cardinals Tauran and Herranz installed at their titular churches. Opus Dei Official Site. Retrieved 2006-11-27. ↑ Opus Dei Corporate Works. Retrieved 2006-11-27. ↑ University of Navarra Named Top Private University. 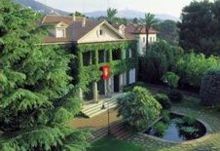 IESE Business School Site. Retrieved 2006-11-27. ↑ Conservative Catholic Influence in Europe. Center for Research on Population and Security. Retrieved 2006-11-27. ↑ 59.0 59.1 59.2 James Martin, S. J.. Opus Dei In the United States. America: The National Catholic Weekly. Retrieved 2006-11-27. ↑ Opus Dei. Cephas Library. Retrieved 2006-11-27. ↑ 61.0 61.1 Raphael Caamano. The Priestly Society of the Holy Cross. Retrieved 2006-11-27. ↑ 62.0 62.1 The Da Vinci Code, the Catholic Church and Opus Dei. Opus Dei Official Site. Retrieved 2006-11-27. ↑ Error on call to template:cite web: Parameters url and title must be specified. Catechism of the Catholic Church no. 405. Retrieved 2007-06-13. ↑ 64.0 64.1 64.2 Corporal Mortification in Opus Dei. Opus Dei Awareness Network. Retrieved 2006-11-27. ↑ They Whip Themselves, Don’t They?. The Da Vinci Code & Opus Dei. Retrieved 2006-11-27. ↑ Suzanne Smith (November 28, 2005). An inside look at Opus Dei. Australian Broadcasting Corporation "Lateline". ↑ Scalia and Opus Dei. Counterpunch (January 17,2004). ↑ Sharon Clasen. Making Modern-Day Martyrs using Medieval Methods. ↑ Behind The Shroud Of Opus Dei. CBS News (April 30, 2006). ↑ Andrés Vázquez de Prada, The Founder of Opus Dei: The life of Josemaría Escrivá, Volume 1: The early years, (New York, 2000). ↑ Ruth Bertels. The Ethics of Opus Dei. TakingFive.com. Retrieved 2006-11-27. ↑ Evolution of Opus Dei. Opus Dei Awareness Network. Retrieved 2006-11-27. ↑ Ordinary Christians in the World. EWTN. Retrieved 2007-03-9. ↑ Opus Dei. Sourcewatch.org. Retrieved 2006-11-27. ↑ Top 100 Catholics of the Century. Daily Catholic. Retrieved 2006-11-27. ↑ Brennan Hill. Who Stood For and Against Hitler?. American Catholic. Retrieved 2006-11-27. ↑ The Opus Dei Awareness Network (ODAN). ODAN.org. Retrieved 2006-11-27. ↑ Opus Dei's Questionable Practices. Opus Dei Awareness Network. ↑ 84.0 84.1 Paul Moses. Fact, Fiction And Opus Dei. Newsday. Retrieved 2006-11-27. ↑ Giles Tremlett (October 5, 2002). Sainthood beckons for priest linked to Franco. The Guardian. Retrieved 2006-11-28. ↑ Deborah Kovach. Princeton Catholic Divided. The Trenton Times. Retrieved 2006-11-27. ↑ Barry James (April 14, 1992). Rocky Road to Sainthood for a 'Choleric' Cleric. International Herald Tribune. Retrieved 2006-11-28. ↑ Damian Thompson (January 18,2005). A creepy scrape with the Da Vinci Code set. ↑ Kenneth L. Woodward (January 13, 1992). Opus Dei Prepares to Stand By Its Man. Newsweek. ↑ Robert Hutchinson (1999). Their Kingdom Come: Inside the Secret World of Opus Dei. Thomas Dunne Books, p.15. ISBN 0-312-19344-0. ↑ Opus Dei in the open. The Bulletin (10/02/2002). Retrieved 2006-05-16. ↑ Paul Baumann. Let There Be Light: A look inside the hidden world of Opus Dei. Washington Monthly. Retrieved 2006-11-27. ↑ Craig Offman (December 2003). Thank you Lord, may I have another?. GQ Magazine. ↑ Peter Gould. The rise of Opus Dei. BBC News. Retrieved 2006-11-27. ↑ Interview with John L. Allen. Kansas City Star. Retrieved 2006-11-27. ↑ Interview with John Allen. PBS:Religion&Ethics. Retrieved 2006-11-27. ↑ Edward Pentin. Profiles: John Allen. The American. Retrieved 2006-11-27. ↑ Francesco Monterisi. The Personal Prelature: a Framework which Enriches the Communion of the Church. Opus Dei website. Retrieved 2007-02-17. ↑ See Pilar Urbano (1995). El hombre de Villa Tevere. Retrieved 2007-01-28. ↑ Bryan Ronald Wilson (December 3, 1994). Apostates and New Religious Movements. Retrieved 2006-11-28. ↑ Julian Cardinal Herranz, quoted in Javier Espinoza. Opus Dei is not a Sect. OhmyNews. Retrieved 2006-11-27. ↑ Julia Baird (2006). Tall tale ignites an overdue debate. Retrieved 2007-04-04. ↑ Sacred Congregation for the Doctrine of the Faith Approved for Publication by His Holiness Pope Paul VI (1976). Declaration on the Question of the Admission of Women to the Ministerial Priesthood (Inter Insigniores). Retrieved 2007-04-04. ↑ You can trust them to sell you a car. The Daily Telegraph. Retrieved 2006-11-27. ↑ Richard Gordon, "What is Opus Dei, and what role does it play at Franciscan University?". The University Concourse. Retrieved 2006-11-27. ↑ Da Vinci Decoded. The History Channel. Retrieved 2006-11-27. ↑ Nicole Zarayn. Opus Dei and The Da Vinci Code. National Catholic Reporter. Retrieved 2006-11-27. ↑ Charles Taylor, The Da Vinci Code" by Dan Brown. Salon.com (March 27, 2003). ↑ Bart Ehrman, (November 1, 2004) Truth and Fiction in The Da Vinci Code: A Historian Reveals What We Really Know about Jesus, Mary Magdalene, and Constantine. Oxford University Press, USA. ISBN 978-0195181401. ↑ Da Vinci Code is 'lousy history'. BBC News (24 December, 2004). ↑ Dan Brown, The Da Vinci Code: Frequently Asked Questions. DanBrown.com. Retrieved 2006-11-27. ↑ Opus Dei on John Allen's New Book. ZENIT.org (DEC. 25, 2005). All Links Retrieved September 17, 2007. O'Connor, William. (1991) Opus Dei: An Open Book. A Reply to "The Secret World of Opus Dei" by Michael Walsh, Dublin: Mercier Press. Walsh, Michael. (2004). Opus Dei: An Investigation into the Powerful Secretive Society within the Catholic Church, San Francisco: Harper. This page was last modified on 21 December 2018, at 19:14.